Silver Cloud provides a perfect combination of all-inclusive luxury and expedition cruising in Antarctica. The ship was stylishly refurbished in 2017 and offers all you expect of Silversea’s restaurant, bar and lounge facilities, though suites are not quite as large as on the line’s bigger vessels. Life doesn’t get better than fine dining with a view of icebergs and snow-covered mountains. The previous cruise was cancelled due to technical problems (I hope you all make it someday). So our ten night cruise was effectively the maiden voyage to Antarctica, but you wouldn’t have known - we were looked after superbly by everyone from the knowledgeable expedition team to restaurant and room staff who, like the guests, came from all over the world. 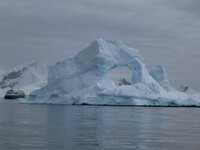 In fact we booked a cruise to Greenland while on board. With 200 passengers, Silver Cloud is more comfortable and faster through the Drake Passage than smaller ships, while larger ones can still only land 100 people at any one time. The Captain wisely decided to spend the first and last nights in port in Ushuaia to avoid bad weather, but our speed meant that we still had the scheduled five days in Antarctica. From the ship we were lucky to spot hump-backed whales and a pod of orca, while on land we visited (and smelled) several penguin colonies and a derelict whaling station; most walking was easy but climbing through snow was a bit trickier. The scenery is breath-taking. Guests were divided into four groups, usually with two landings or a landing and zodiac cruise each day. Zodiac embarkation could be a little slow due to sea conditions and the few other negatives were trivial. There was a shortage of facecloths and we preferred the espresso to the regular coffee; the internet worked throughout the cruise, albeit sluggishly. Silversea offered charter flights from/to Santiago, Chile, but we made our own way to Ushuaia and stayed in the excellent Los Cauquenes hotel. Finally, some travel tips: The summer temperature in Antarctica hovers around freezing point but the wind-chill is substantial and you can get drenched by sea spray in the zodiacs. 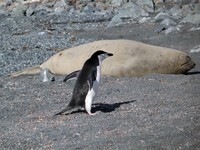 The South Shetland Islands were mild and drizzly the first day; it can feel warm in the sun too. Silversea’s clothing advice is reasonable: one or two base layers, a middle layer (eg fleece), wind/waterproof pants and ski gloves, and the supplied parka. For longer Zodiac cruises you can add a woollen sweater, jogging bottoms and fingerless mitts. Wear spare glasses on excursions or use goggles that fit over glasses. Waterproof insulated boots are essential for wet landings; get the Bogs rental boots one size larger than your normal shoe size to allow for thick socks. Boots and parkas can both be exchanged on board if you order the wrong size. Wet hats and gloves can be dried with a hairdryer or in the laundrette. 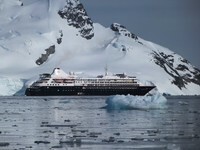 Silver Cloud provides a perfect combination of all-inclusive luxury and expedition cruising in Antarctica. The ship was stylishly refurbished in 2017 and offers all you expect of Silversea’s restaurant, bar and lounge facilities, though suites are not quite as large as on the line’s bigger vessels. Life doesn’t get better than fine dining with a view of icebergs and snow-covered mountains. The previous cruise was cancelled due to technical problems (I hope you all make it someday). So our ten night cruise was effectively the maiden voyage to Antarctica, but you wouldn’t have known - we were looked after superbly by everyone from the knowledgeable expedition team to restaurant and room staff who, like the guests, came from all over the world. In fact we booked a cruise to Greenland while on board. With 200 passengers, Silver Cloud is more comfortable and faster through the Drake Passage than smaller ships, while larger ones can still only land 100 people at any one time. The Captain wisely decided to spend the first and last nights in port in Ushuaia to avoid bad weather, but our speed meant that we still had the scheduled five days in Antarctica. From the ship we were lucky to spot hump-backed whales and a pod of orca, while on land we visited (and smelled) several penguin colonies and a derelict whaling station; most walking was easy but climbing through snow was a bit trickier. The scenery is breath-taking. Guests were divided into four groups, usually with two landings or a landing and zodiac cruise each day. Zodiac embarkation could be a little slow due to sea conditions and the few other negatives were trivial. There was a shortage of facecloths and we preferred the espresso to the regular coffee; the internet worked throughout the cruise, albeit sluggishly. Silversea offered charter flights from/to Santiago, Chile, but we made our own way to Ushuaia and stayed in the excellent Los Cauquenes hotel. Finally, some travel tips: The summer temperature in Antarctica hovers around freezing point but the wind-chill is substantial and you can get drenched by sea spray in the zodiacs. The South Shetland Islands were mild and drizzly the first day; it can feel warm in the sun too. Silversea’s clothing advice is reasonable: one or two base layers, a middle layer (eg fleece), wind/waterproof pants and ski gloves, and the supplied parka. For longer Zodiac cruises you can add a woollen sweater, jogging bottoms and fingerless mitts. Wear spare glasses on excursions or use goggles that fit over glasses. Waterproof insulated boots are essential for wet landings; get the Bogs rental boots one size larger than your normal shoe size to allow for thick socks. Boots and parkas can both be exchanged on board if you order the wrong size. Wet hats and gloves can be dried with a hairdryer or in the laundrette. Nicely refurbished: Comfortable bed, sitting area with couch and two chairs, walk-in wardrobe useful for luggage and expedition gear, and bathroom with shower (some have a bathtub). The veranda was great for looking at the view. Suites now have USB and universal electrical sockets that take US, European and UK plugs among others. We slept fairly well even through the Drake Passage. Interesting walk along the beautiful lake shore. Enjoyed the Tren del Fin del Mundo (an hour one way, tourist class is fine, US$ 45).